I love to eat all sorts of fish. My wife however, only eats salmon. Therefore, I have to get somewhat inventive when it comes to cooking salmon because for me, I can get tired of it after a while. 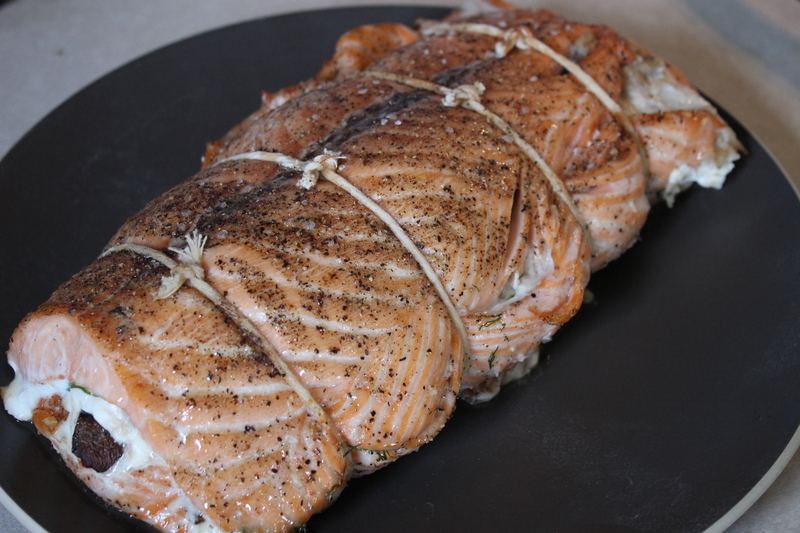 For this recipe I used two large slabs of salmon and rolled them into what looks like a meat roast and then stuffed the inside full of crab meat, veggies, and cheese. It came out pretty much awesome. It also fed us for a quite some time because of all the meat in such a small space. This is rather easy to make, but it does take some preparation for it go off without a hitch. So as you might think by the picture it looks pretty tough, but it really isn’t. Like most of my recipes, gathering all the ingredients is often times the challenging part. 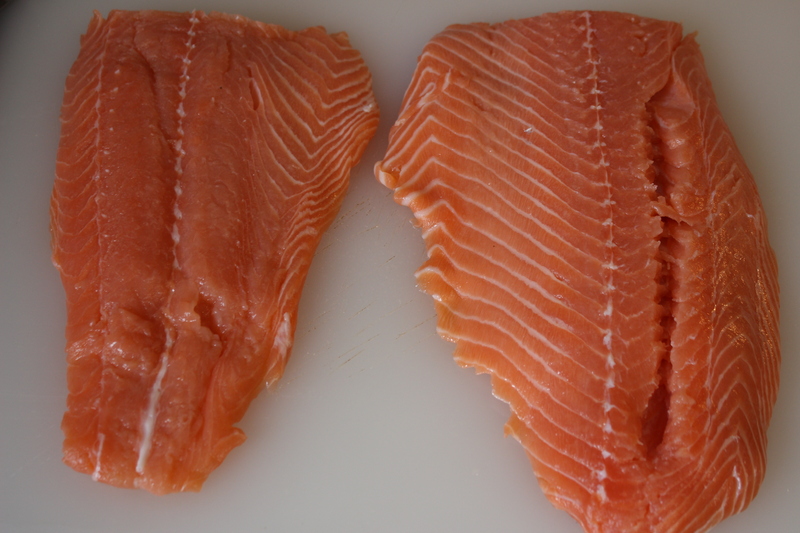 To get started, remove the skin from two large slabs of salmon and lay them on a cutting board or clean counter top. Next, use the backside of a spoon and spread the ricotta cheese like spreading peanut butter on one slab. 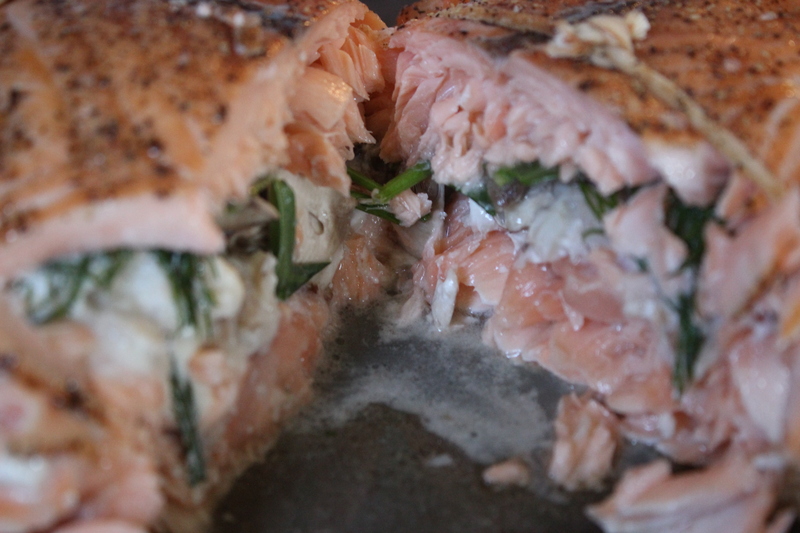 Sprinkle on the salt, pepper, Parmesan cheese, mushrooms, crab meat, spinach, and top it all off with the fresh dill. 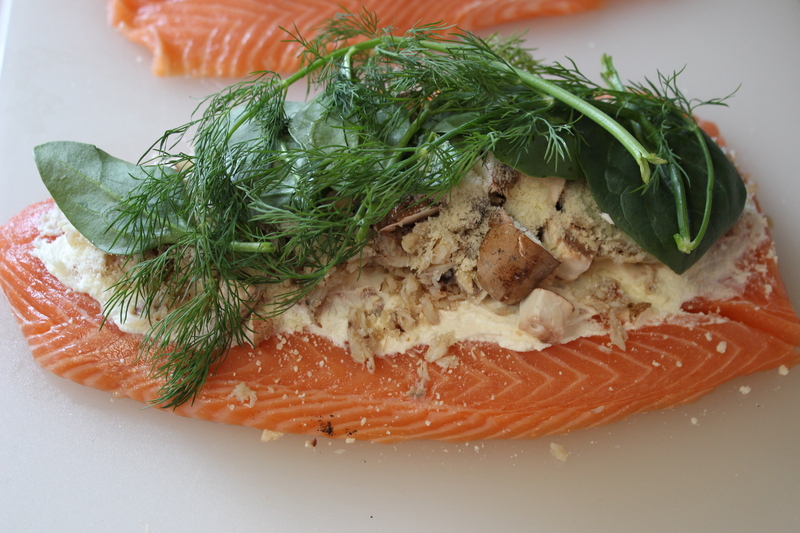 For the next part, simply place the other salmon slab on top of the first sandwiching everything inside. 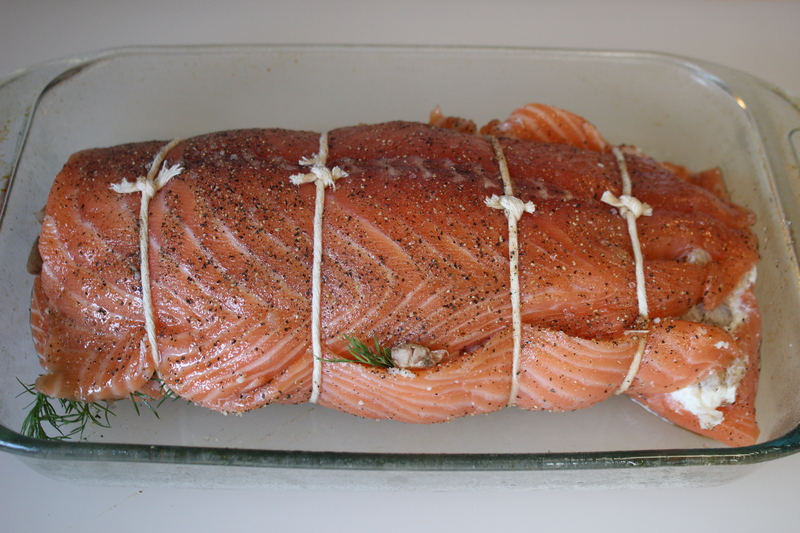 Use some baking string and tie it up so it forms what looks like a roast. Sprinkle salt, pepper, and sugar all over the outside of the roast. At this point it should be fairly easy to manage. Put it in the oven for about 30 minutes at 350. Cooking time will vary depending on the thickness of the fish and the amount of ingredients you decide to stuff the inside with. I used actual crab claw meat from the grocery store. I would have used the fake crab meat found in packages for a fraction of the price but my wife just refuses to eat that…so…the real stuff had to do. Feel free to experiment with different ingredients and create you own to fit the seasons or whatever tastes good at the moment. If you would like to see more recipes and other outdoor related content, follow me on Twitter at @bradsmith319. Enjoy!